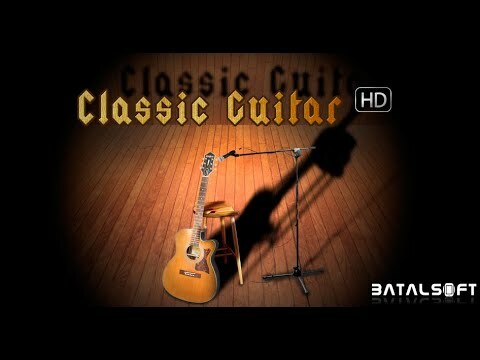 Classical Guitar HD is the best acoustic guitar simulator on Android. To use this virtual and intuitive classical guitar only place your fingers on the fretboard to make chords and play your music. You can learn and play accompaniment for your favorite songs. Beginners can download the chords or tabs from the web, and practice and learn how to play songs with rhythm, while creating their tracks. For more advanced guitarists, it will serve as a tool for composing accompaniments for their musical creations. Unlike other applications, it is very easy to use. Just tap the strings on a note, and the chord will play, in the major or minor desired tone. - Tap frets on the fretboard to play chords. - Make your jam sessions just using your cell or tablet and record an unlimited number of notes from your songs or riffs. Record, repeat and do playback on your sessions. - Suitable for Spanish guitar performers.